A stunning and startling composition, easy to miss due to the incongruous white paint scheme it has been saddled with in later years. A bold C-shaped rim of limestone gives the building the appearance of being set within an incomplete picture frame. 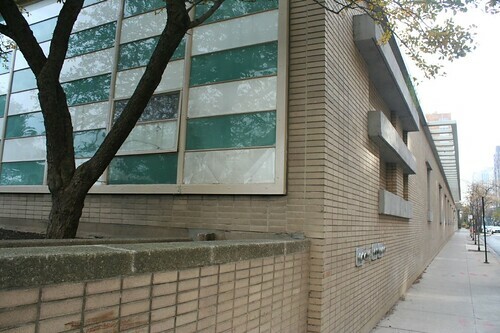 When new, the building’s visual impact was far greater; the tiles between the raised sections of windows on the front facade were black, and the bricks in the recessed areas were red. At some point, both were painted white, greatly diminishing the intended contrasts of horizontal and vertical elements. 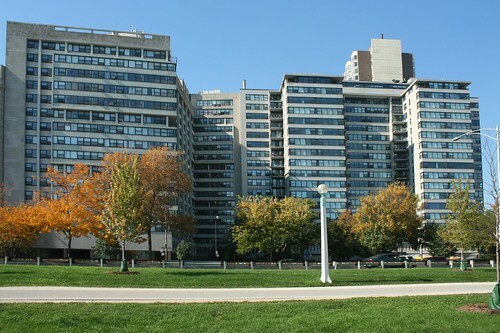 3440 Lake Shore was built with 220 rental apartments, ranging from studio units (rents starting at $37.50 per month) to two bedrooms up to $182.50 a month. A second-floor parking garage holds 117 cars. 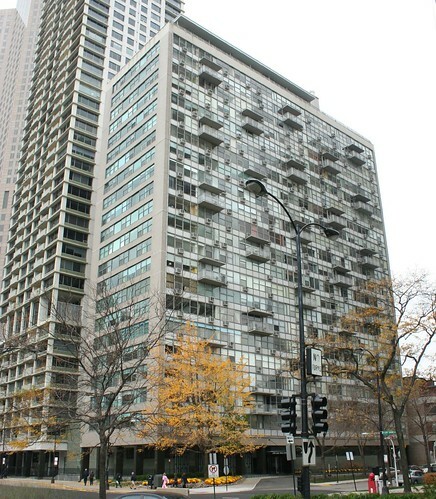 Architectural Record found the building worthy of notice, publishing a short article in October 1951, and small wonder – this is one of a very few Chicago apartment towers to truly aspire to high Modernism, rather than a localized pastiche. 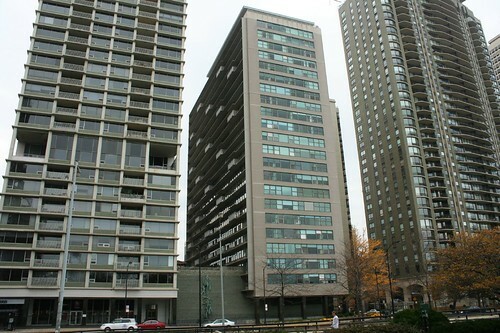 After holding out for two decades while its neighbors went condo, the building was converted to condominiums in the late 1990s. A sibling to its slightly-older neighbor, 3440 directly abuts 3410. Construction began in late 1954 and continued into 1956. Though at a casual glance, one might mistake the two for a single building, 3440 is a far less adventurous building than its neighbor, symmetrical and conventional in its form and massing. 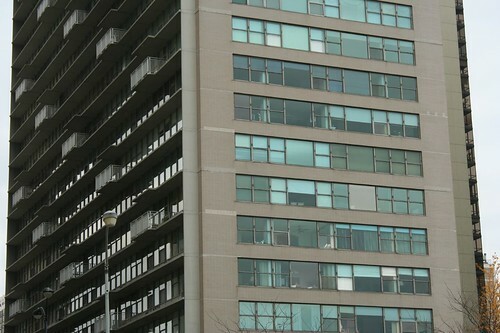 It is clad primarily in glass and white brick. 3440 included full air conditioning when built, as well as “Cloric built-in ovens and stainless steel sinks with Formic atops. Magnetic door G-E Refrigerators…Bathrooms by Crane – distinctive colored fixtures accented with matching Ceramic tile. Handsomely mirrored with new Lavinettes.” “So advanced it could not have been built before 1955.” It was converted to condominiums around 1981. Begun in 1953, opened by 1955, this building at the corner of Lake Shore and Belmont is the most stridently 50s structure on the lakefront. Geometric details animate its base on all sides, and its color scheme can’t be mistaken for any other decade. 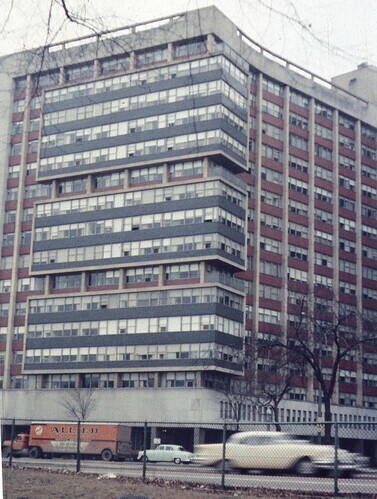 3180 N. Lake Shore was converted to condominiums in 1975. 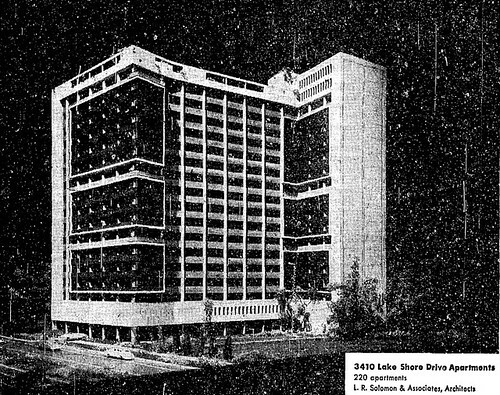 Begun in April 1953 and opened in mid-1954 after a record-breaking construction pace, 1000 Lake Shore contained 183 apartments when new. 185 cars could park in the garage at the base, which is sheathed in glossy green brick. The target market was well-to-do, as 6 months’ advance rent and a 5-year lease was required to move in. Tenants included the Owings from Skidmore, Owings and Merrill, and a president of Borg-Warner. The building cost $4.5 million to construct. 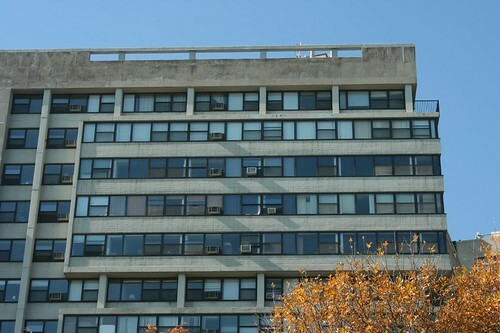 The building reacts intelligently to its site; the south-facing windows are protected from summer sun by continuous concrete shades, which also poke out to provide sheltering roofs for the balconies.) On the north side, it’s solid glass. 1000 N. Lake Shore has, relatively speaking, a good side and a bad side – and the good side is largely covered up by its looming neighbor. 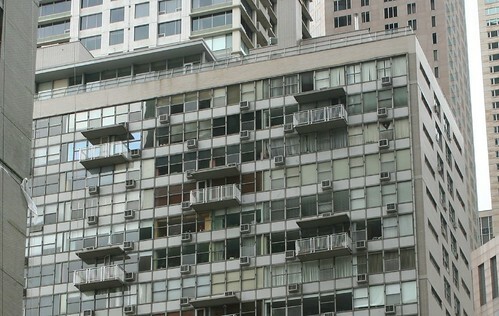 The building did not include central air conditioning, “for reasons of cost”, resulting in a grid of pockmarking AC units sticking out of the facade. The original windows and mullions are still in place, and are showing their age. 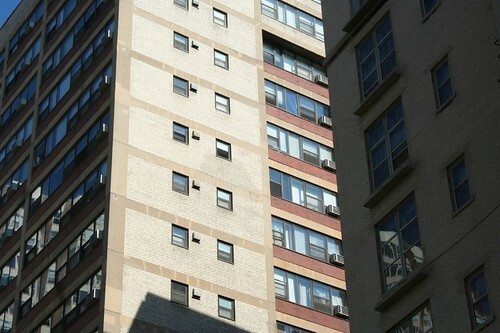 The variety of individual window treatments, the aging frames, and the air conditioner units give the north facade a particularly unkempt look today – though it’s nothing a smart rehab couldn’t fix. 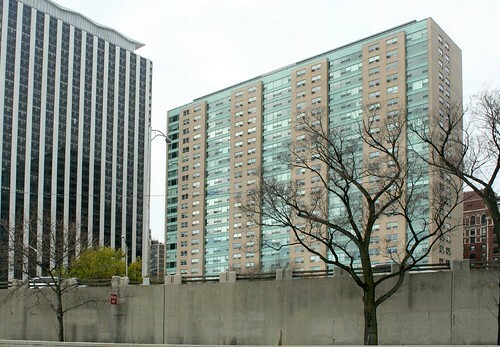 The building took some heat in its own time, too; it was among those cited by a 1955 Architectural Forum article that criticized “an incredible rash of imitations and vulgarizations” of Mies van der Rohe’s 1946 Lake Shore Apartments; 1000 Lake Shore was cited in particular for its balconies being too small. 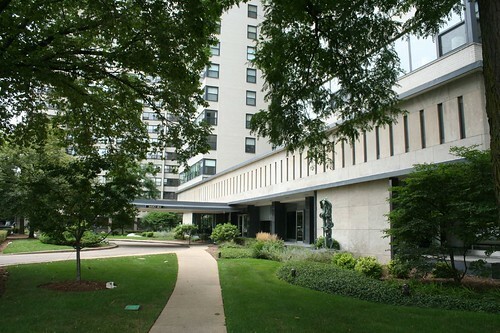 1000 Lake Shore Drive went up on the site of the McCormick mansion, designed by Solon S. Beman. One of the city’s most famous mansions, the McCormick Mansion was a center of high society at the turn of the century and a holdout in Victorian formality until the end. The death of its matron, Mrs. Edith Rockefeller McCormick (brother of John D. Rockefeller Jr.), was page one news in 1932. After being foreclosed and sold at auction, the house became the private Bateman School for a number of years, until owner Metropolitan Life Insurance booted the school out and sold it to a consortium, which demolished the mansion in 1953. Construction on the high rise began immediately. 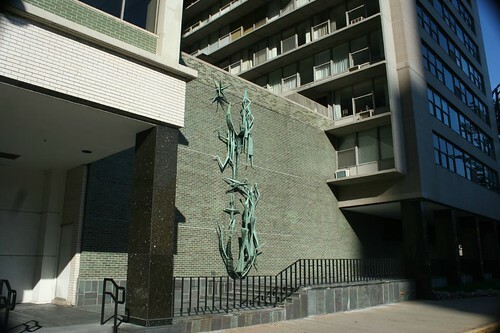 The building also includes a stylized sculpture by California sculptor Bernard Rosenthal, representing the African Gold Coast, unveiled on the day of the building’s topping out. 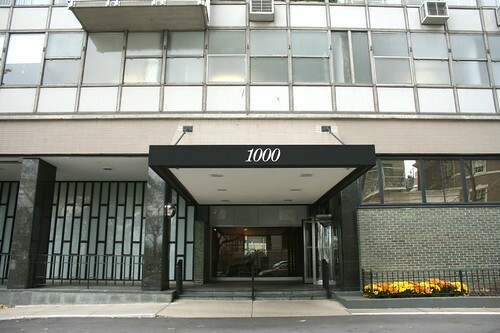 This entry was posted in Chicago neighborhoods, Lake Shore Drive, Midcentury Modernism. Bookmark the permalink. 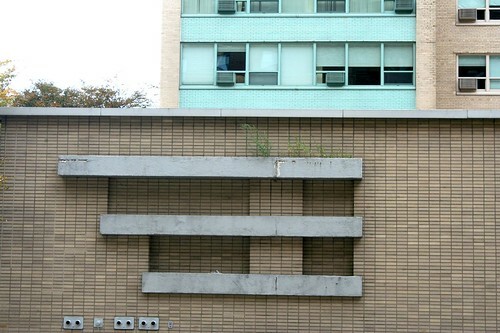 Funny, I was just thinking of all those mid-century buildings around Belmont Harbor the other day. And my lifetime partner looked at us buying into 1000 N LSD, but the monthly assessment was already over 1K ten years ago. Another excellent article! not sure why 3 of the 4 buildings here are in lakeview & the headline says "gold coast" … maybe "lake shore drive" would be more appropriate? Love your blog, but your geography is wrong. 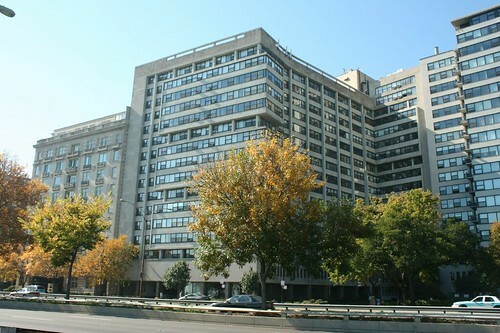 The only building noted in your post that is located in the Gold Coast is the 1000 N. Lake Shore Drive. The others are located in Lakeview. Great entry as usual (your posts are always fun and readable). 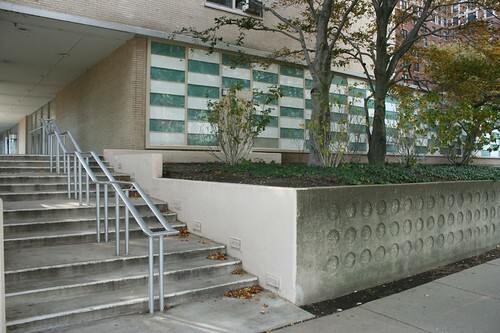 Interesting tidbit, 1000 LSD used to have these perforated sides to the north balconies (and the railings themselves if I remember correctly) – not perforated metal, mind you, but maybe 6" diameter in a beige solid material which was replaced at some point around 1990 I think. You're right about 3410-20, it was much more distinctive before they painted it beige. It's a solidly built building for the most part though. It's units are much smaller, almost dramatically so, from 3440's which are quite large and well laid out.